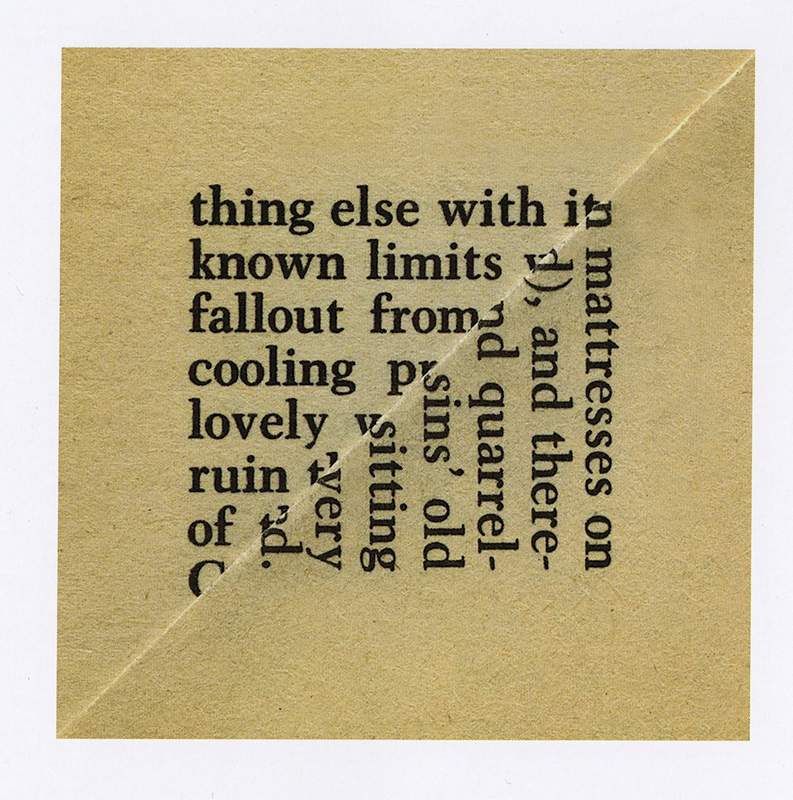 Christine Nelson, Davy Knittle and Erica Baum joined Al Filreis to talk about Erica’s Dog Ear, a book of photograph-poems, in which each poem is a meticulous reproduction of a dog-eared page of a mass-market paperback photographed to isolate the small, diagonally bisected squares or rectangles of text. The group focused on three poems: “Fallout,” “Geisha,” and “Enclosing” (click the linked titles to view the texts). These are, respectively, plates six, seven, and twelve in the printed book, which can be acquired from Ugly Duckling Presse of Brooklyn, New York, in a lovely, inexpensive edition. The conversation took place in the Arts Cafe of the Kelly Writers House before a live audience, and is being made available as a video recording (see below) and the usual podcast audio. Some have dubbed Erica’s work “photo-poetics.” And as you’ll hear during the discussion, Erica favors that designation — appreciates being deemed a member of the poetry community. A curator and archivist at the Morgan Library, Christine has had a lot of experience with “enclosures that are missing” (in manuscript letters, for instance) and thus she helpfully focuses our attention on the dog-eared page called “Enclosing.” “What do these physical traces reveal, and what do they withhold? There is always something missing.” Indeed, as Erica suggests, that is the essence of her art. The page of a book is inevitably — by virtue of its technology — turned, and in that act of turning (as in turn the page and page-turner) a worn and perhaps even intimate readerly mark is created on (atop) the text. 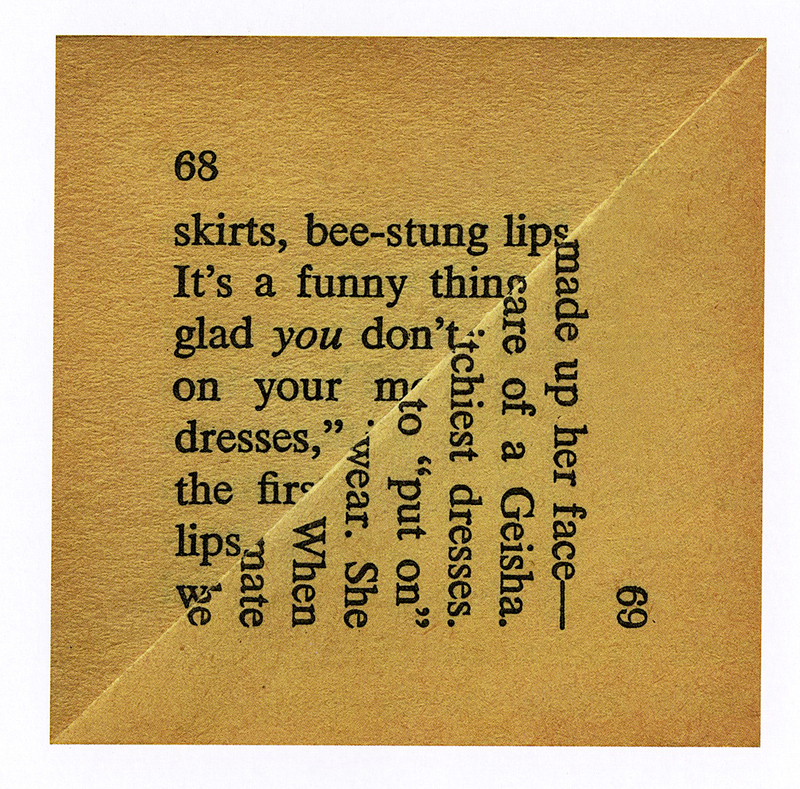 Printlessly, the reader expresses what’s important to her in the gesture of creasing and so permanently alters the page’s material fiber. And because of that, the poem turns away from explication, narrative, telling, revelation. The poem hides something even as a result of the very act of the reader’s effort to track a personal path through reading. 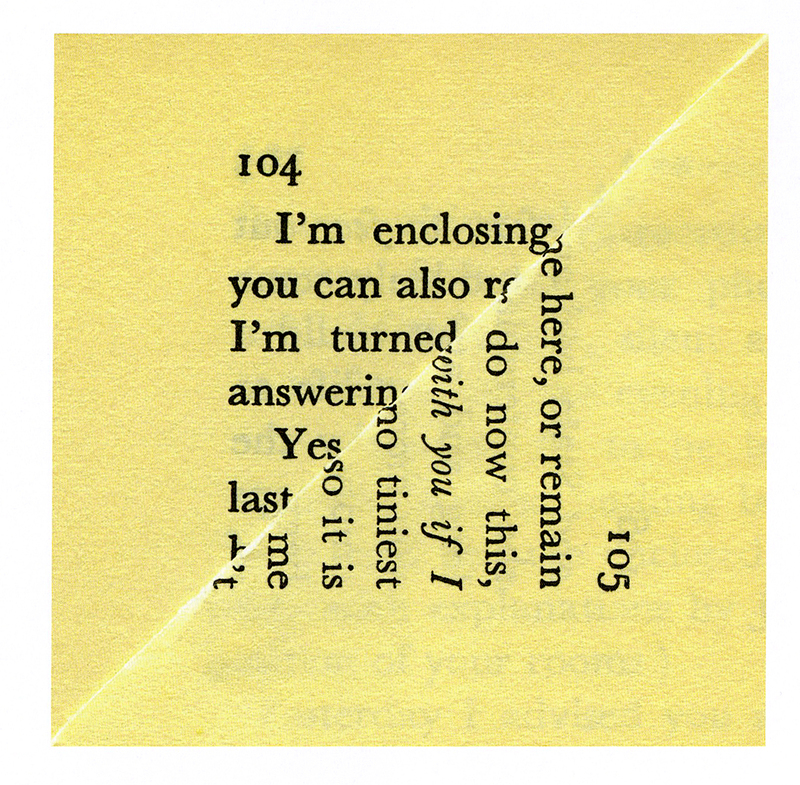 Print page-based poets we admire effect such nondisclosure, of course — Dickinson, Niedecker, H.D., et alia — but here the hiding results not from writing discontinued or disrupted but by a certain discovered view, which is then photographically memorialized. 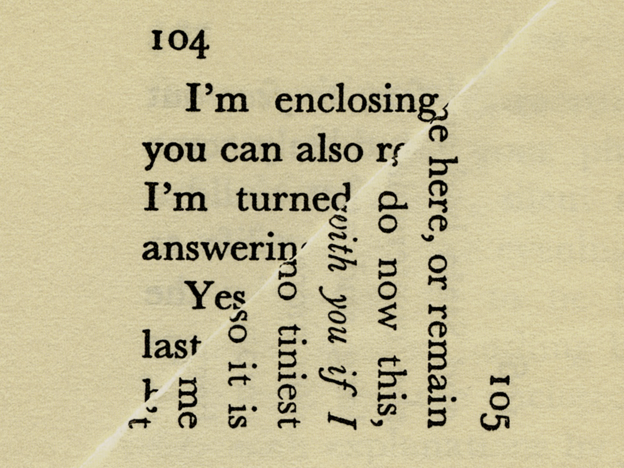 The unknown reader post facto has become a creator, or cocreator, of the text we now partially see. This episode of PoemTalk was engineered and recorded by Chris Martin and Zach Carduner in tandem. Zach Carduner then edited both the video and audio. We are grateful as always to Nathan and Elizabeth Leight for their ongoing support of PoemTalk and other “digital poetries” projects hosted by the Kelly Writers House.